Beat whipping cream until soft peaks form, add honey and beat just until stiff and fluffy. Refrigerate until ready to use. In a small pot, heat together jam, bourbon and water, cooking just until jam is melted and mixture begins to boil. Toss in cherries, remove from heat and allow to cool slightly. Set aside a little less than half of the mixture. Arrange a layer of 8 pizzelle cookies atop a cake plate. 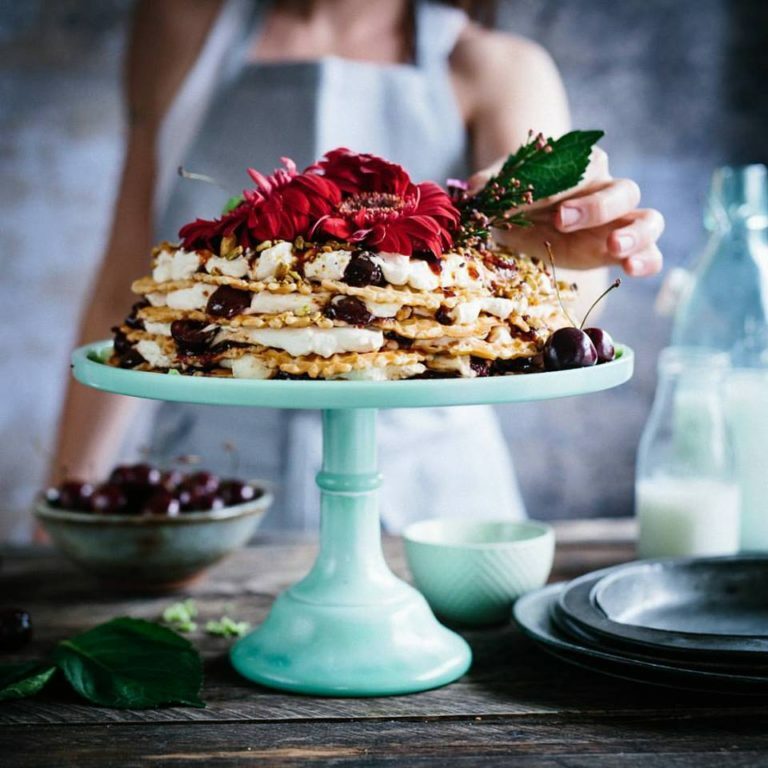 Drizzle with a small amount of cherry mixture, top with a thin, even layer of cream, then repeat layers of pizzelles, cherry sauce and cream, until all are used. Spread a final layer of cream on top. Cover gently with plastic wrap. Refrigerate overnight. When ready to serve, heat remaining cherry sauce and drizzle on top. Garnish with flowers or cherries, if desired. Sprinkle with pistachios.